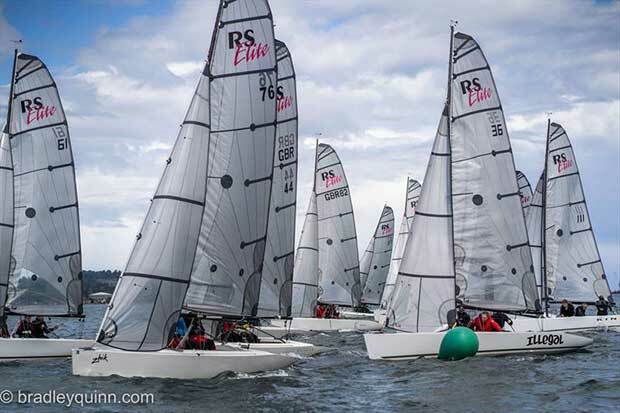 Carrickfergus hosted the RS Elite Championship at the weekend. 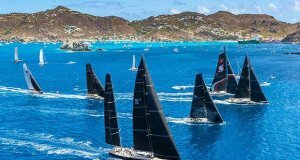 There was strong competition on the start line of a sixteen strong fleet. The Current UK Champion Mike McIntyre on Foudafafa was over from England to get the feel of the local waters before the Brewin Dolphin RS Elite UK National Championship in two weeks time over at Royal North. Other contenders were Tiffany Brien on Kin, Jeff Ralston on Up front and local Carrick Lad Ryan Wilson on Eclipse. During race two a large squall came down the Lough ramping up the wind. Mike McIntyre’s Foudafafa once again stayed on top this time Tiff Brien giving the leader all the pressure on second and the Bangor Boys Stephen Polly on Storm third and Ryan Wilson in fourth. All was to change for race three as the wind had gone light and was coming from the shore. 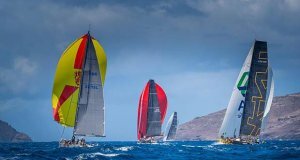 After a correction of the race course the race got underway with Oli Lochead starting very successfully on a port tack flyer. Ross Vaughan was also up at the top of the fleet and all looked good until the wind stopped playing. After about ten minutes the breeze picked up from a totally new direction, paying dividends for those at the back of the fleet and upsetting the former leaders. Storm was now in pole position to take the win followed by Jeff Ralston in second, Kin in third and Foudafafa in fourth. After day one Mike McIntyre’s Foudafafa was leading the event, Storm in second and Kin third. Day two saw the competitors not at their best after the championship dinner! But again Sunday’s wind was steady. Race four was again tight between the fleet, and the start was key to this race, a boat length misjudgement and your race was over. Foudafafa once again took line honours, followed by Storm with UpFront third and Ross Vaughan’s Toucan in fourth. At the start of the fifth race the points at the top were tight. Storm going better today taking the win followed by Tiff Brien and Foudafafa in third and Ralston once again fourth. The last race was all to play for and a wee bit controversial. Tiff Brien was leading this race, however on the downwind leg approaching the committee boat the blue finish flag was hoisted during lap one (in the sailing instructions you could not sail downwind through the start/finish line while this flag was up). Tiff had to crash gybe sail around the committee boat and lost her comfortable lead (the flag was later lowered again… oops). Storm took this final race and the Championship on nett points, Mike McIntyre in second, although with gross equal points to Storm. Positions third and forth also had joint equal gross points, after discards with Tiff Brien third and Ryan Wilson fourth. Jeff Ralston finished fifth overall. Well done to Carrickfergus for running a fun event. Very well done to the Storm boys, Stephen Polly, John Gunning and David Kelso. 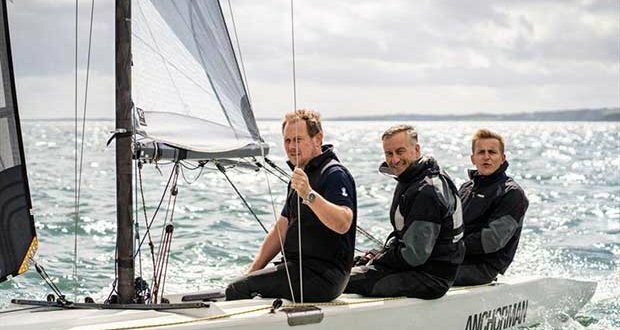 The Brewin Dolphin UK National Championship is in just over a week’s time with the first race on Thursday 28th June, hosted by the Royal North of Ireland YC. 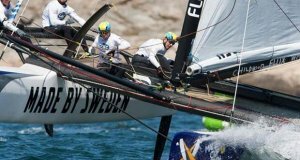 To have two national championships in such a short period in unusual, but great for the fleet! Several South Coast English boats are expected, the local boats don’t plan to make things easy for them!